Located in the South West of England, Dartmoor is named after the River Dart that runs through it and the weathered moorland that gives the National Park it’s distinct, eerie character. Indeed, Dartmoor National Park is the home of many myths, legends and ghost stories, inciting tales of pixies and headless horsemen, as well as being the inspiration for writers and artists such as Agatha Christie, Sir Arthur Conan Doyle in The Hound of the Baskervilles, and even some mystical scenes from the Harry Potter film series. Famously dotted with 160 granite outcrops known as Tors, Dartmoor is popular for walking and climbing, while historians flock to find an area rich in archaeology and the home of many abandoned medieval villages from the Bronze Age and Neolithic Times. Today, remains can still be found; like those at Hound Tor. Wistman’s Wood is another example of Dartmoor’s history, believed to be leftover from the ancient forest that covered Dartmoor circa 7000 BC. In fact, despite its name, only half of Dartmoor is made up of moorland. There are also a multitude of reservoirs, rivers and woodland in the National Park where much wildlife can be found. It is not unlikely to find wild horses roaming the moors, or to spot some of the large population of birds that call Dartmoor home. Due to the height of some parts of the moor, and the temperate climate that is found in this part of England, Dartmoor is generally wetter and milder than areas at the same height. Its eerie feel is amplified by the fog and mist that it is often shrouded in, or find it on a clear day if you’re lucky and marvel at the vast 360 degree views of rolling hills, woodland and moorland. With much of Dartmoor being open Access Land, walkers are allowed to roam freely and wild camping is allowed. Rambling and camping on Dartmoor is spectacular at all times of year; just be prepared for the unpredictability of the weather, wild horses roaming around your tent, and an eerie Dartmoor ghost story to be heard. This is an idyllic forest and moorland walk starting just outside the village of Lustleigh. Being only 3 ½ miles, you can enjoy a Dartmoor ramble and still have time to see some sites before sunset. Park just outside the village of Lustleigh and take the public footpath (on left hand side) into the forest and follow until views open up onto the beautiful forest in the valley below. 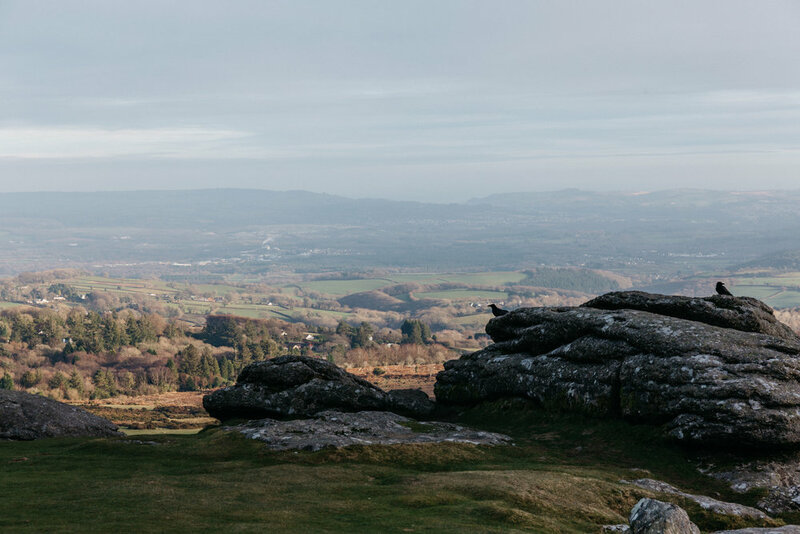 When you reach the boulders at Raven’s Tor, you’ll find an exceptional viewpoint over the forest and hills (that perhaps you’ll want to keep a secret!). Keep following the footpath onto open moorland as Hunter’s Tor comes into site, with views to Bovey Castle in the distance. Head down through Peck Farm and then take a left leading onto a forest track, through the quaint village of Foxworthy and back through the forest to your starting point. 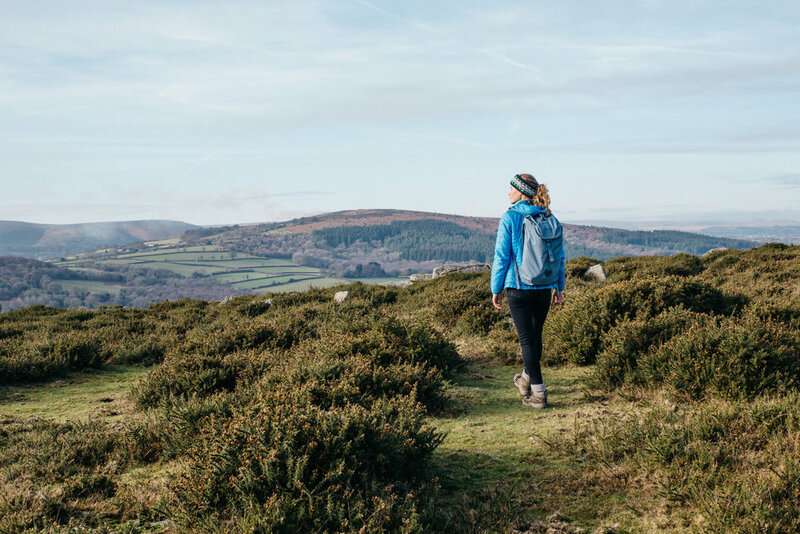 With a combination of rich woodland and open moorland, this walk is a great way to see what Dartmoor has to offer. Getting there: From Lustleigh, take the small road to the left of the church that heads towards South Harton and follow until you reach a junction. Turn right on narrow lanes and follow for around 300m until you reach some parking spaces in a lay-by. At a house called Loganstones, there is a footpath on the left that leads to the start of the walk. Walk: The walk is 3 ½ miles and goes through forest, moorland and farm tracks. I would recommend wearing walking boots as the forest can be muddy. Bring some snacks as there is nowhere to buy food enroute, and a warm jacket as it can be windy on top of the moor. Much quieter than its more popular neighbours of Hound Tor and Hay Tor, Bonehill Rocks is a cluster of granite boulders nestled on the moor, with beautiful views down to the lovely village of Widecombe in the Moor. On a typical foggy day on Dartmoor, Bonehill Rocks are eerie and mysterious. Filled with timeless character and tales of bygone years, as crows perch on the highest rocks and wild horses roam the area. Bonehill Rocks are also popular for bouldering, or link a walk between Hay Tor and Hound Tor via Bonehill Rocks. On a pleasant day, enjoy a picnic on the boulders with lovely, peaceful views. Getting there: From the B387 between Haytor and Widecombe in the Moor, take the right hand fork towards Hound Tor, then the first lane on the left that leads to the rocks. Before heading a-wandering on the moor, why not head for a traditional English breakfast at the lovely Ullacombe Farm Shop & Cafe. Cosy up inside the barn and enjoy a hot brew and brekkie, made with local produce and ingredients. The meat at Ullacombe Farm Cafe comes from local Devon farmers, sourced by the Bovey Tracey butcher, Cox & Laflin. As well as the cafe, there is a farm shop selling locally sourced goods from bread and eggs, to Devon-made cider and organic vegetables. As well as breakfast, the farm shop serves delicious lunches, tea and cake. Or why not pick up something from the bakery and farm shop to take on your walk? Getting there: Ullcacombe Farm Cafe is situated on the B3387 heading west from Bovey Tracey. Opening times: Open Monday to Sunday 8.30am to 5pm. The easily accessible Hound Tor is certainly worth a trip when in Dartmoor National Park. A weathered granite outcrop, Hound Tor has an eerie feel with a backdrop of Dartmoor’s rolling hills beyond. Wander around the rocks and find hidden caves, or sit down with a flask of tea and admire the view. You can also link Hound Tor with a walk around Hay Tor and Bonehill Rocks. Getting there: From the B3387 between Bovey Tracey and Widecombe in the Moor, take the road to the right signposted to Hound Tor. Continue to a carpark on the left and the indistinguishable view of Hound Tor on the right. Situated in the southwest of Dartmoor, Sheeps Tor is a cluster of granite rock formations spread across the hilltop with views dominated by Burrator Reservoir to the west. It’s possible to trad climb at some parts of Sheeps Tor, or wander down to the Beechcroft Plantation on the edge of the reservoir and create a circular walk through the forest, heading back via Yellowmead Stone Circle, a bronze age concentric stone circle. The view from Sheepstor down to Burrator Reservoir is certainly one to experience on a Spring day when blue skies warm the surrounding hills and forests; enjoyed with a picnic or a cup of tea atop the hillside. Getting there: From the village of Sheepstor, situated just 4 miles from Yelverton, it is possible to park on the lane heading east from the village church. From there, it’s an easy ramble up to the Tor. Head west from the Tor towards the reservoir to meet a path that runs beside the forest. The Dartmoor Guide will be updated as we continue to explore the National Park.